NEW Order Calculators! Try it out! * THIS FORM IS FOR QUOTING PURPOSES ONLY! PLEASE CALL TO PLACE AN ORDER! * If you have not gotten a response within a couple days, please call to confirm your request was received. The Stout Stand is a new revolutionary product. This specially designed patent pending heavy 7 and 8 gauge Galvanized Spring Steel wire will drive into the ground effortlessly by stepping on the thick middle wire and pushing down with your hand on the top cross member, unlike H wires that will bend due to a lower gauge wire. Don’t worry about those cold winter months trying to put flimsy wires into the frozen earth and straightening them back to normal after bending them under your foot. With these wires you’ll have the job done in a flash. Your signs will no longer bend or topple over in the wind. These specially designed Spring Steel wires will stay standing strong in most weather. The Stubby Stout Stand is the Stout Stand’s little brother. This specially designed heavy gauge wire will drive into the ground effortlessly by stepping on the thick middle wire. The Stubby Stout Stand should be used with larger signs, such as 24×48 or 48×32. These stakes will keep your sign closer to the ground providing them with excellent stability in windy conditions. 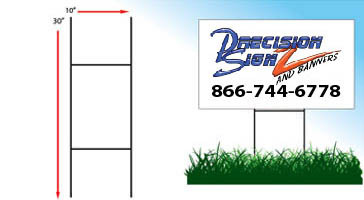 The Stout Stake is the best selling single 8-gauge spring steel wire with a slight bend in it for positioning the sign. These stakes are our lowest priced option, but they still stand up to the elements better than other imitation stakes. Say good bye to they oily mess when handling these stakes, as they are made out of Galvanized Spring Steel, you no longer need to protect your hands. 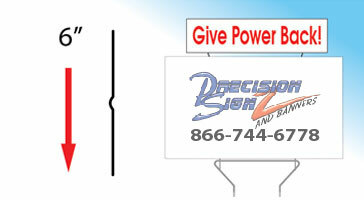 For best results, use 2 per sign on small signs and up to 4 per sign for medium signs. The Ground Buster is an upgrade from H style stands. Customers were more than impressed with its performance, you thought it was great, but we’ve made it even better. While still using heavy duty 8-gauged Spring Steel wire and being specially designed for ease of installation we’ve galvanized it to make it even better! No more oily wires and no more rust! Patent Pending. While our name implies that we only sell Spring Steel products, the Double H-Stand is not. However, it is still made of heavy 9-gauged steel and is also galvanized to prevent rust! The H style stand is an industry standard, we’ve just improved upon the style therefore making it a more viable and sturdy solution for the industry as a whole. 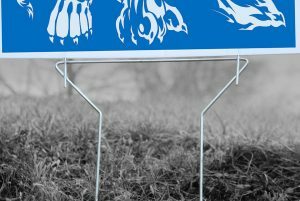 These stands are 8-gauge wire frames used for Plastic Bag Signs.The Threaded U-Wire is a revolutionary patent pending product. We find that by having the ability to unscrew the wire into three pieces you can mail the wires for a highly discounted rate compared to the cumbersome large shipping crates usually used with U-Wires. These specially designed Spring Steel wires will stand up in most weather conditions. 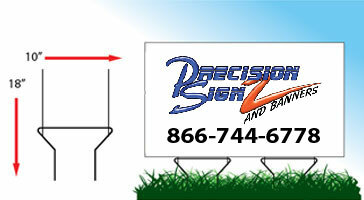 Sign Riders are a staple in the real estate business, but can be used for many other purposes. Our 6″ Rider Pin can help! Simple installation, Galvanized, and 9-gauge wire with a bend in it for easy positioning makes this wire a home run when it comes to adding extra messages to your existing signage. The L-Wire is a versatile wire. It is made up of 9-gauge spring steel which keeps it strong no matter how its used. 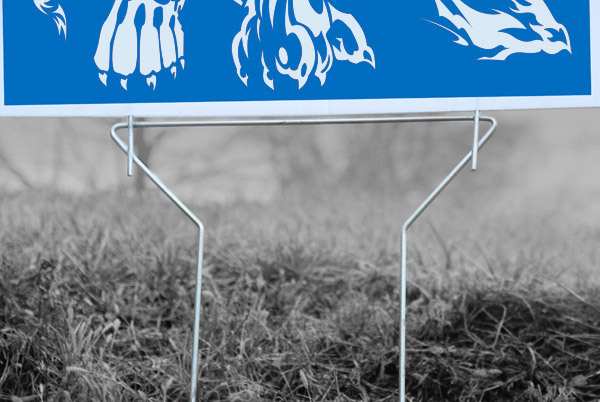 You can use it to hold up your sign while still allowing the sign to swing a little in the wind. Or you can use it to make larger signs sturdier by inserting them in the flutes. You may also use them to attach sign riders. However you use them we’re sure that your sign will stand up strong. 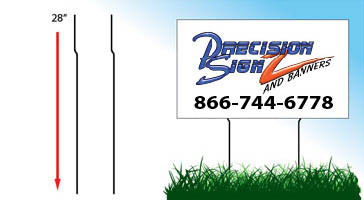 Using better stakes for your yard signs makes it easier than ever to advertise using yard signs. 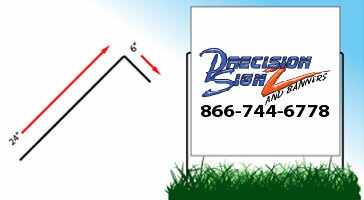 Using steel wire stakes eliminates the need to constantly fix your yard sign after the wind has blown it over, or collapsing from the weight of the sign itself. You will waste your money on good advertising for sales, events, and political campaigns with yards signs that can’t be seen. 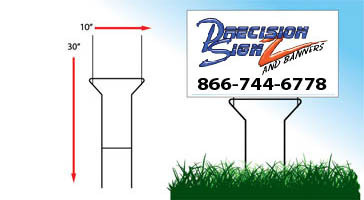 Whether you buy steel wire stakes separately, or they come with the yard signs you have purchased, make sure they are the best stakes you can get. 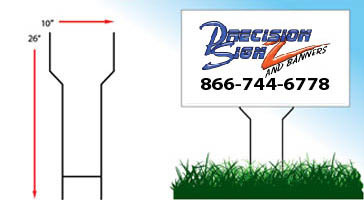 By using a thicker gauge of steel wire, there is more stability for the yard sign. 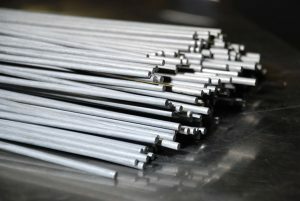 Combine that with the superior stake design, you will ensure you get the most bang for your buck. These wires are 7-gage wire frames used with Polycoated Cardboard signs and Plastic Bag Signs. They are included in the price, but can be also sold separately.